Formulated to work as a satisfying meal. Consuming convenient and satisfying meals and snacks in fewer calories – a necessity for proper weight control in the 21st century. Consuming ideal amounts of carbohydrates, protein and fat in a form that can be rapidly digested before and immediately after exercise. Doing so enhances workouts, recovery and performance. For more complete product information, watch this video. For delicious shake recipes click here. Figure 1: Training results from 23 experienced recreational bodybuilders resistance training for 10 weeks with all things (diet, supplements, training, etc.) equal except the addition of pre/post feedings. 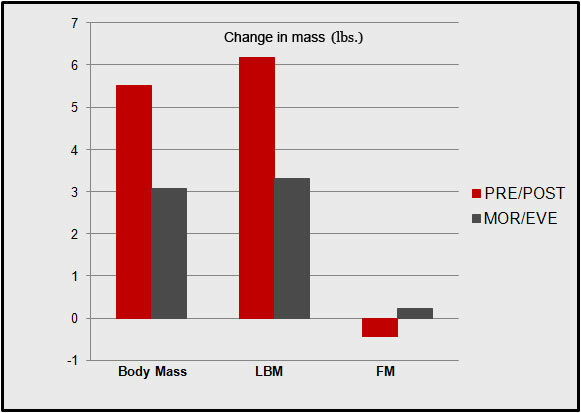 Significantly greater gains in body mass, LBM & strength were realized for the pre/post feeding subjects with a concurrent reduction in fat mass.